It has come to our attention that there is currently recreational tree climbing occurring in the Castle Grove in the Central Walbran, Kaik:ks, Pacheedaht First Nations territory. Climbing ropes have been left hanging from one of the ancient Cedars and a trail has been cut to the base of the tree. 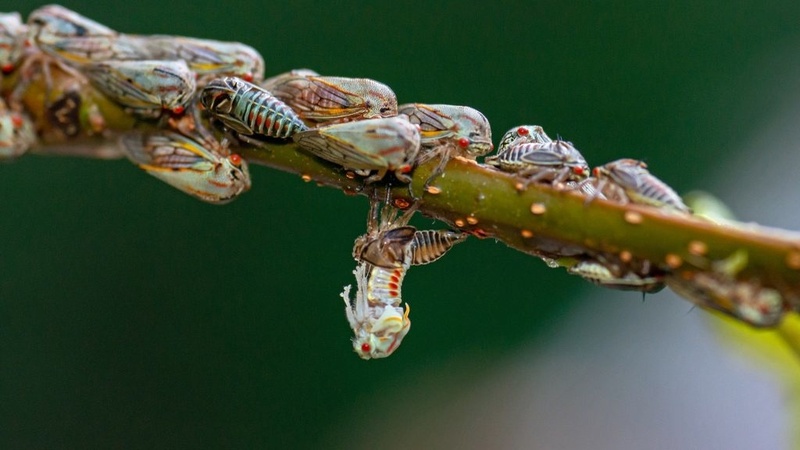 This development is troubling to us as the damage from climbing to the delicate suspended soils and plants in these trees, the epiphytes and hanging gardens in their canopies is irrevocable. These have taken as long to develop as the trees themselves and could be over 1000 years old. If these are damaged a critical habitat for rare and endangered species such as Mettriopa walbranesi, Marbled Murrelets and other species that rely on the canopies of these ancient trees would be lost. The rich alluvial flats that give the Castle Grove its giant Cedar trees is an isolated fragment, surrounded by clear-cuts and tree farms. With this type of forest remaining on less that 3% of Vancouver Island it makes the Castle Grove a very precious place. It is one of the reasons that environmentalists and First Nations have struggled and worked for almost 30 years to have this area protected. As we learn from our First Nations allies we have come to appreciate these trees as Elder Trees that need to be respected and not just for the spectacle of their size as Giants. 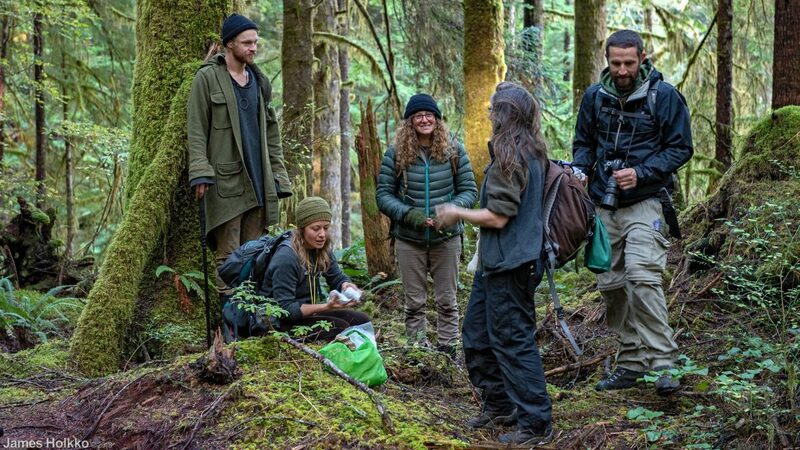 The climbing of Old Growth to protect it from logging differs from recreational climbing, it carries on a long tradition of direct action that has actually helped save forest, for example the Carmanah Walbran Park. So please respect the last of these ancient trees, don’t climb recreationally in the Old Growth and if these are your ropes please take them down. 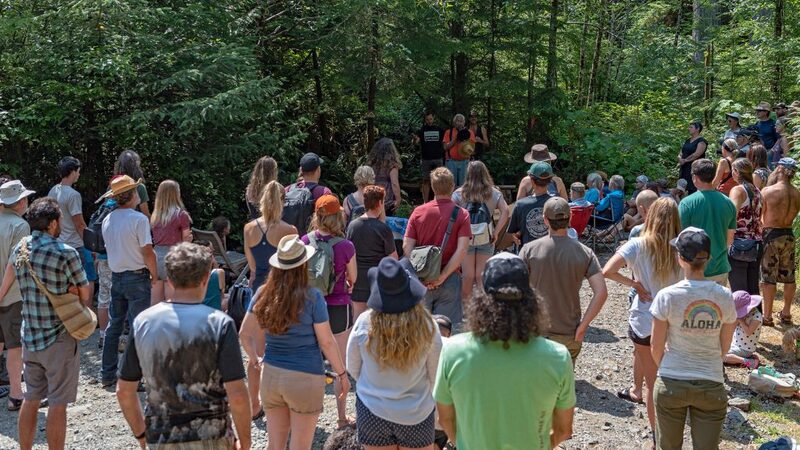 Sunny weather was waiting for the 25 plus mushroom experts and enthusiasts who made the journey out for the inaugural Walbran Myco-Blitz in the threatened Central Walbran, Pacheedaht Nation territory. The Saturday started with a circle and brief introductions, there was also a small talk on the ethics, the do and don’t s of mushroom identification and picking in this rich but fragile Rain Forest. The walks and foraging mainly focused on the lower section of the Harriett Nahanee Memorial Trail which follows the low elevation forest along the river. 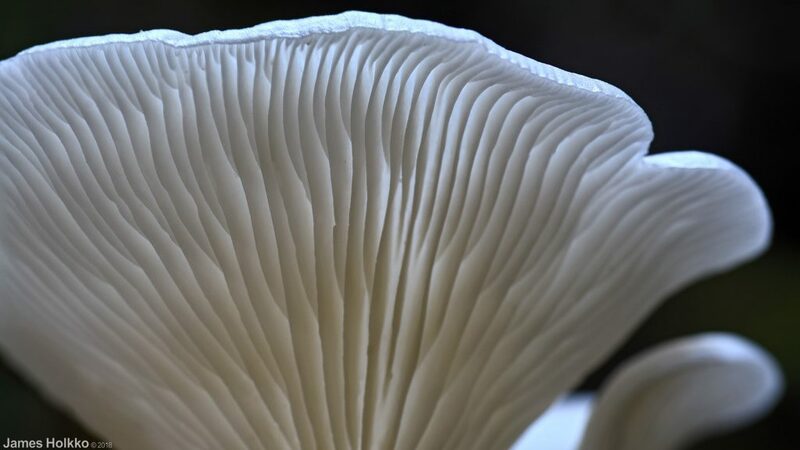 In the Saturday afternoon and Sunday morning walks there were almost 80 different species of Fungi that were identified. The itemized list will be available to view as a tab on the home page. There were many highlights on the weekend including the mushroom species Phaeocollybia which has an extraordinary root, looking similar to a stalk of Bull Kelp, which runs underground for almost 2 feet. Many thanks to all those who helped out with identification Juliet, James, Sinclair Jason, Emma and all those who attended. Also Ron Ramsey who lent us a 12v light set up that made the dark evening task of identification so much easier. See you next year. 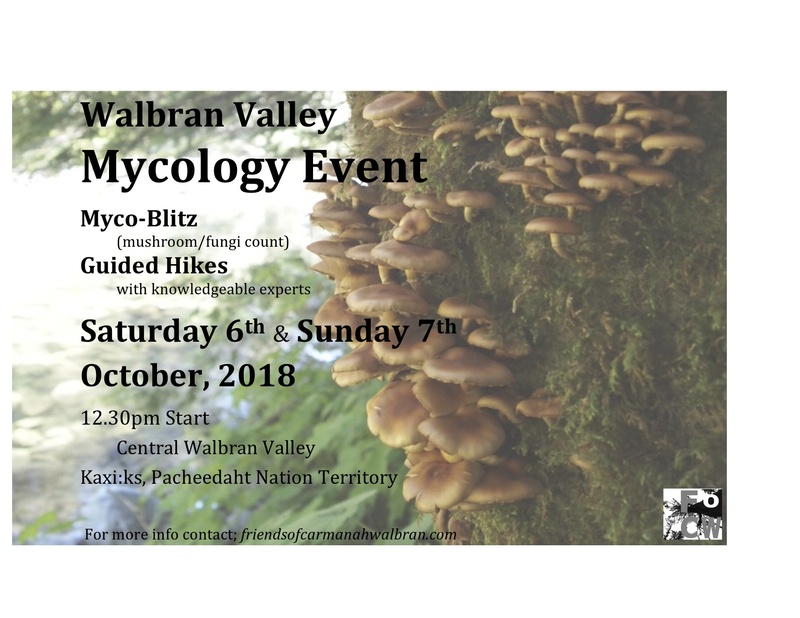 Join the FoCW on Saturday October 6th for a Myco-Blitz (a mushroom and Fungi identification and count) with guided hikes and knowledgeable experts. 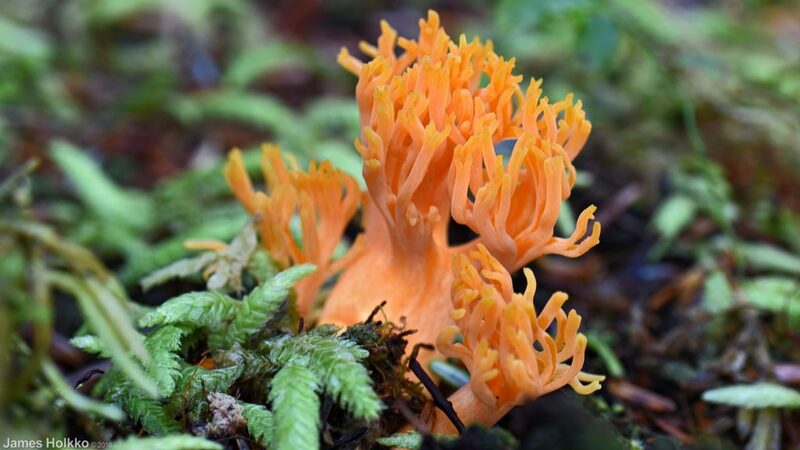 For those wishing to camp overnight until Sunday 7th there will be the opportunity to continue with the exploration of the Temperate Rainforests of the Central Walbran Valley and its diverse and productive mycology. 4.30pm. Return and revue and identification of unusual finds. 1pm; Return and revue and identification of unusual finds. It’s that time of the year again! 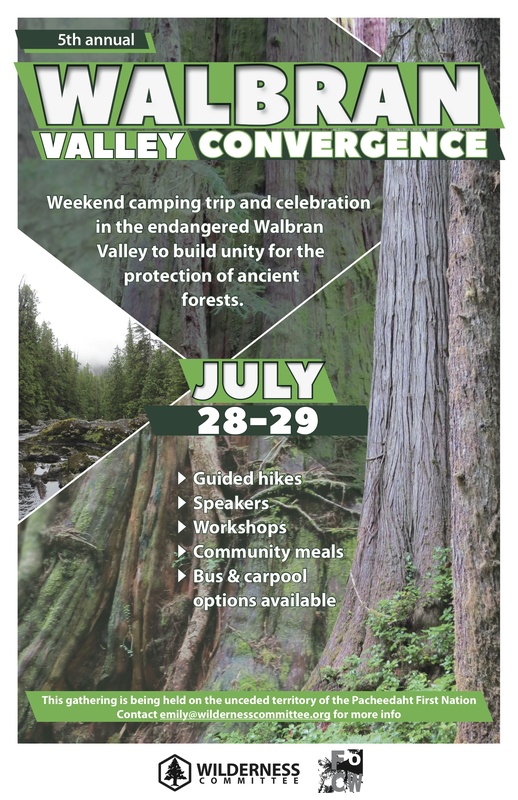 Time to get stoked for the 5th Annual Walbran Valley Convergence! 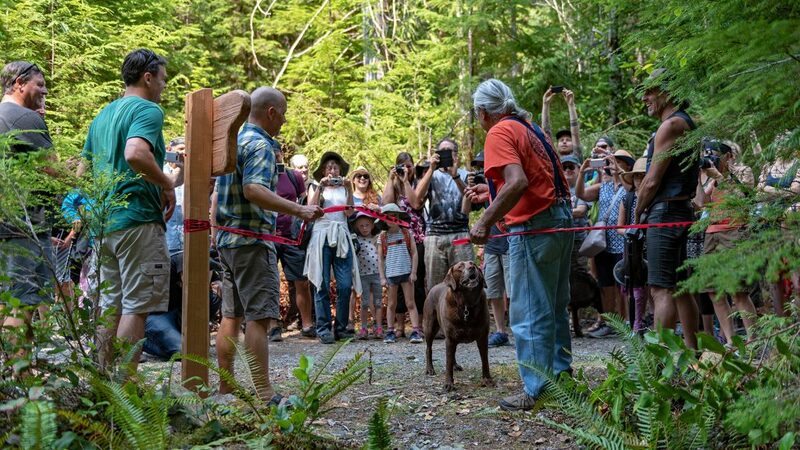 Taking place in the unprotected heart of Kaxi:ks (the Walbran Valley) in unceded Pacheedaht territory, this annual gathering is a celebration of forest activism and the ongoing fight to protect the Walbran and all threatened ancient forests on the westcoast. This event is to build unity towards the protection of endangered rainforests and a just transition to sustainable second-growth forestry that prioritizes Indigenous rights and title and local communities. 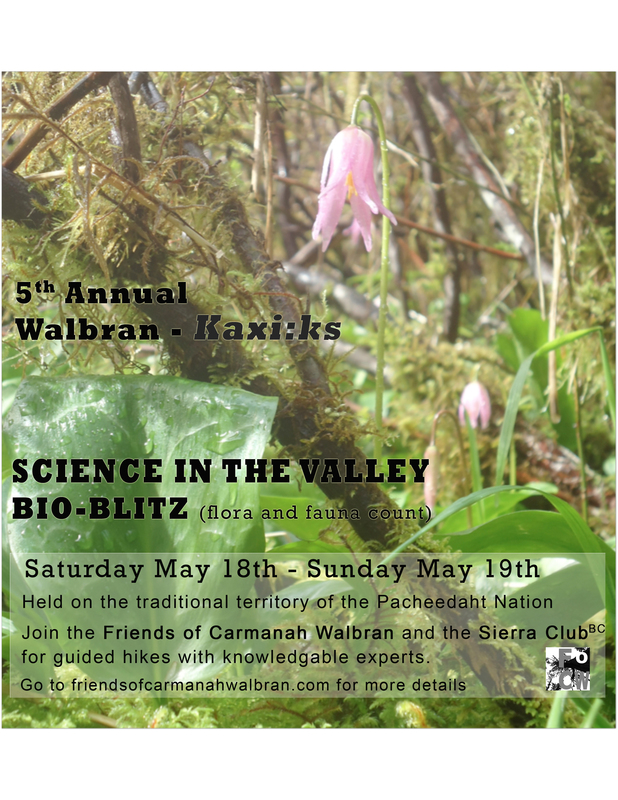 Hosted by the Friends of Carmanah Walbran and the Wilderness Committee, this multi-day event will feature speakers, the official opening of the new Emerald Pool Boardwalk loop trail, community meals, informally guided hikes, workshop offerings, an evening performance by our favourite west coast folk singer Luke Wallace and more, and will include members of the Pacheedaht Nation, grassroots environmental justice groups, elected officials, business and labour leaders and many more! – Day-trip transportation from Victoria and Duncan via the Community Action Bus at a sliding scale of $25-$50; or pay what you can. We are asking those who can afford to pay the high end do so to help ensure that nobody will be left behind for lack of funds. -will be prepared for Saturday dinner and Sunday breakfast. A vegetarian dinner of Greek cuisine will be available on a sliding scale of $15-30 and breakfast on the Sunday morning) will be by suggested donation of $10-20. Meals can be arranged by etransfer to friendsofcarmanahwalbran@gmail.com or through cash-drop at Wildfire Bakery or the Wilderness Commmittee office.